Friends and Family support Matthew Muns, a junior at Oakland University, by attending his official book release and signing on Sunday, Dec. 20. On Sunday, Dec. 20, I had the honor and pleasure to attend a book signing and celebration of an Oakland University student’s new self-published book. That student is Matthew Muns, and he is not only a fellow Golden Grizzly, but an old friend of mine from high school. I’ve known Muns for many years. We’ve taken several photography courses together, and when I heard that he had written and published the first book of a trilogy I was both a little jealous and extremely thrilled! Of course I was going to attend his big debut event and write up an article for him. My review of his novel will be at the end of this article. 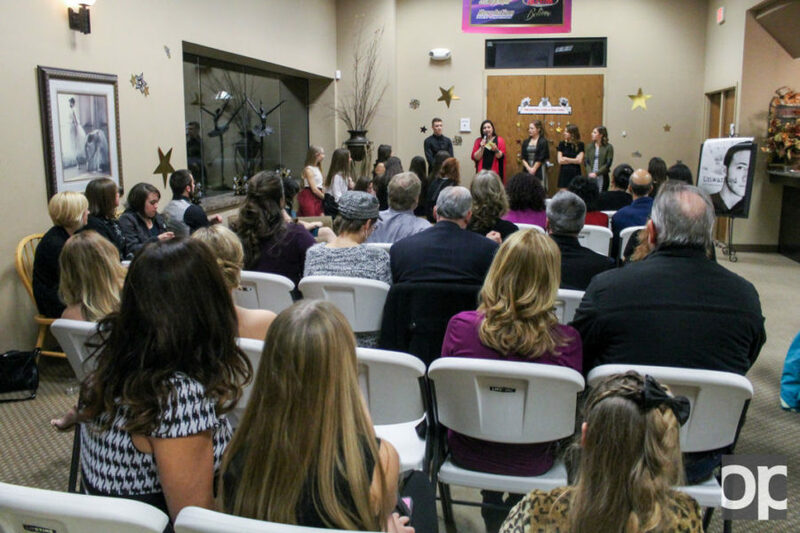 The Golden Celebration, as it was called, was held at Suzette’s Master of Dance studio in Shelby Township. At least fifty people arrived to support Muns with his new book. Appetizers and drinks were available for guests, as well as a photo booth which was popular with the kids. Family, friends, and some of Muns’ dance students came to shower him with praise. When I saw Muns, he gave me a big hug and was practically shaking from excitement. After all, he was accomplishing one of his dreams at only twenty years old. The event kicked off with a book reading, where Muns read a passage of his book from the first chapter, then moved onto testimonials, a Q/A session, and finally a speech from the author. After all the speeches were complete, Muns spent an hour signing books and taking photos with his friends, family, and new fans. Once he was done, I had time to talk to him one on one about his life experiences. Muns has lived an interesting and adventurous life. Ever since he was a child, he was outgoing and creative. He started acting at the age of four, and in high school took photography classes. During his free time, he would go on late night adventures with his friends and family, play video games, or write. Nowadays, he is a full time dance teacher at Suzette’s Master of Dance. He teaches Acrobatic Gymnastics, as well as Aerial Silks. Despite all of his interests, he says that his true passion for life is people. “A lot of my motivations in life and what I do is centered on how I can help people. I think that was impacted with how I was raised,” Muns said. He grew up in an interesting household. He is the son of two preachers, who raised him to give back to the community and to help others. His parents had always focused on giving to the community and helping the people of their church and their families. This was a big impact on Muns life and his own creative process. “I think creativity finds new and innovative ways to help,” he added. Muns had always felt like he had desired to tell a story, and of all the mediums he tried to do so, it was writing that made the most sense for him. His love for literature began his freshman year of high school when more advanced English courses were required. However, it was one particular teacher and novel that sparked his passion. “The most defining moment was during my junior year with Mrs. Prescott. She made me fall in love with what literature really represents. We read The Great Gatsby, and when she explained what the symbolism was, I knew I wanted to do that with my writing,” Muns explained. Other than the English courses required in high school, he had never taken any additional classes to work on his writing. He is completely self-taught and learned simply by practicing and learning. In addition to writing, Muns is an avid reader and believes that reading is just as important as writing when it comes to being a better author. He doesn’t limit himself to a particular genre. Instead, he reads all kinds of novels and enjoys the ones that make him feel connected to the characters. He was inspired to write Unwanted by a distinct image he had one night almost two years ago. It was of two boys sitting on a fence in a field, with their work jumpers hanging loosely around their waists, talking about running away from the world. When he told his friends about it, they said he had to write it down. All he knew was that he wanted to share his own story in a creative and fictional way that would impact the lives of people. Other inspirations for the book was the Book of Revelations and other popular dystopian novels, such as The Hunger Games and Divergent. However, Muns specifies that’s where the similarities between his novel and other dystopian stories end. “Hunger Games and Divergent are definitely a good doorway into what my novel will be like, but my novel has its own voice, feel, and tone. When you explore it you’ll discover very quickly it has its own vibe,” he explains. He wrote most of the first novel on his phone over the span of a few months. Everywhere he went he was writing, jotting down notes, and sending drafts to his friends. It was the first time he had ever exposed himself in such a way, by sharing the very first drafts of his novel the moment they spilled out onto paper. “Sharing the experience of writing was what I enjoyed most about writing. My friends got to see the novel at all the stages, and they were begging me to continue. Their energy and questions and theories inspired me to finish it,” Muns explained. While writing and editing, he would listen to music to motivate him. Twenty One Pilots was a major influence on Unwanted, and was the cure for his writer’s block. “It was purely ‘Vessel.’ I had that playing 24/7 while I was writing. Tyler Joseph’s lyricism really inspired me. If Unwanted were ever made into a film, I’d want them to be a part of the soundtrack,” Muns said. As for creating the characters, a lot of his characters were inspired by people close to him in his life. Once Unwanted, as well as the second and third book, were completed, he started the process of publishing. He decided to publish through Amazon, and the entire process took only a few months to complete. Amazon had representatives, graphic designers, and editors help take Muns’ work to the next level. Muns’ integrity as an artist is what made him decide to self-publish. One of the biggest decisions Muns’ had a say in was the cover. The portrait on the cover is meant to represent Jonah, the protagonist of the novel. However, it isn’t a stock photo from the internet. It is Muns’ own portrait gracing the front of his novel. He received a message a couple of weeks later of the cover, and that’s when Muns realized they used the picture he had sent. They said they had liked it and it had suited the theme. Muns bargained to retake the picture, and that is how the current cover came to be. Now that the book is published and shared with the world, with two more novels coming soon, the next step to fulfilling his dreams is to have Unwanted adapted into film. Something that I learned during my time at the Golden Celebration was about Muns’ insecurities while writing Unwanted. It was a side of Muns I had never seen before, and one that touched me deeply. During the Q/A session, one of Muns’ students, a young girl named Bella asked if Unwanted was based on Muns’ life. At first, his response was yes, and that he put a lot of himself into Jonah. However, later on during his speech, he started to get deeper into his explanation of what the trilogy meant to him. “So beyond just saying how thankful I am for this night and for each and every one of you, I look around the room and I see each of your faces and I’m flooded with memories. You guys are an amazing blessing to my life,” Muns began humbly. Then, his voice began to waver and he had to pause to regain composure before continuing. To learn that there was a time where Matthew Muns, the outgoing and creative spirit that once filled up the high school photography classroom we shared with joy and fun, had felt unwanted was shocking. It left the entire room in silence and many of the attendants with tears. However, with grace and dignity, Muns spun the speech around to invite everyone to go on this new and exciting journey with him, and to give advice to his dance students. Read my review of Unwanted here.